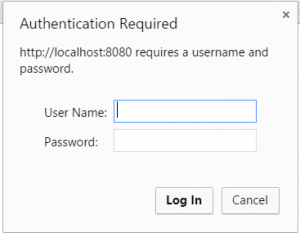 Here is an example of spring boot basic authentication using spring security. Security most important feature while working application especially for the web application. The application does not allow to access all information for all user based on user ROLEs allowed to information to complete those requirement spring security is a very useful module of spring. While developing REST API using spring boot basic authentication will be too much important. Here is the complete example of spring boot basic authentication. At following places, basic authentication plays an important role. Now run your application and try to access location:8080. It will ask for entering username and password. If authentication failed than it will return 404 status code. Its indicate Unauthorized access. To work with spring security following spring boot dependency is requires. Here is complete pom also available. Here users are created in memory. It can be overridden by UserDetailsService if required getting user details from the database. This configuration will automatically enable spring security. By default, spring security will enable for URLs. * Created by JavaDeveloperZone on 04-08-2017. Its startup class to start spring boot application. This controller can only be accessible if a user is authenticated. If user tries to access page first spring security ask for basic authentication and current user details it will be allowed to access information from it. * Created by Java Developer Zone on 19-07-2017.